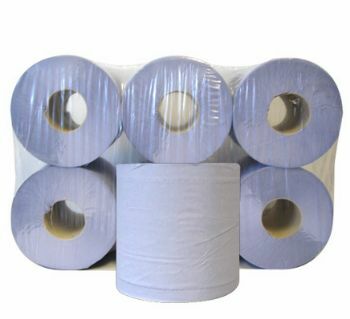 Standard quality blue centre feed rolls. (Also known as pull through rolls). Made from thick 2ply recycled blue paper. These centre feed rolls can be used in multitude applications including wiping and drying. The centre feed roll is most commonly seen in catering kitchens, schools, petrol forecourts and workshops. This is mainly due to its great absorbency. This alone makes this a very efficient and cost-effective product. Each roll is 150 meters. Size: Per roll 193mm wide x 195mm high.